The house sparrow (Passer domesticus) is a bird of the sparrow family Passeridae, found in most parts of the world. A small bird, it has a typical length of 16 centimetres (6.3 inches) and a mass of 24–39.5 grams (0.85–1.39 ounces). Females and young birds are coloured pale brown and grey, and males have brighter black, white, and brown markings. One of about 25 species in the genus Passer, the house sparrow is native to most of Europe, the Mediterranean region, and much of Asia. Its intentional or accidental introductions to many regions, including parts of Australia, Africa, and the Americas, make it the most widely distributed wild bird. 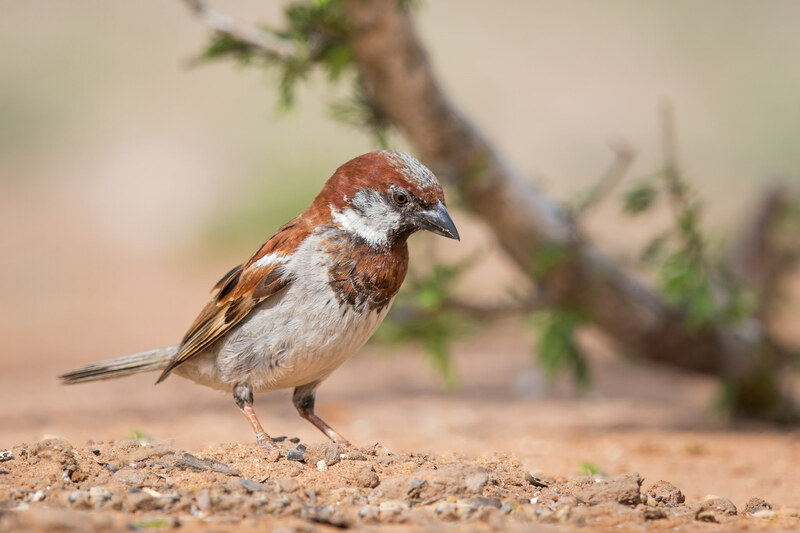 Because of its numbers, ubiquity and association with human settlements, the house sparrow is culturally prominent. It is extensively, and usually unsuccessfully, persecuted as an agricultural pest, but it has also often been kept as a pet as well as being a food item and a symbol of lust and sexual potency, as well as of commonness and vulgarity. Though it is widespread and abundant, its numbers have declined in some areas.